BUENA VISTA — With a word of thanks to Southern Virginia University students who pitched in on his presidential campaign, Mitt Romney invited the school’s 145th class to dive wholeheartedly into life to raise families and serve God. “Hundreds of you gave up vacation time to help a candidate for president, for which I owe you deeply. Thank you so much,” he said. But he didn’t come to talk politics to the small college where most share his Mormon faith. In only his second public speech since losing the election, Romney set his theme by quoting a verse from the Gospel of Luke when Jesus advised fishermen who had failed to catch anything to head farther out and launch their boat into deeper waters to set his theme. But he went ahead and raised five sons with his wife, Ann. He told the roughly 120 graduates that to marry and to have children are paths to an abundant, happy life. He told a story about how Ann won applause from a hard-charging group of Harvard Business School students when she described her choice of career as a full-time mother. He told the graduates of the college about what he called another launch into the deep — the missionary work that so many young Mormons embark on when they finish school. It is a time many Mormons say was the hardest in their lives, but also the best, he said. But Romney continued with some words of caution. And he reminded the students that serving God is something all can do, telling a story a friend had told him about seeing 85-year-old Russell Nelson , one of the 12 members of the Mormons’ governing body, shoveling a neighboring widow’s walk after a snow. 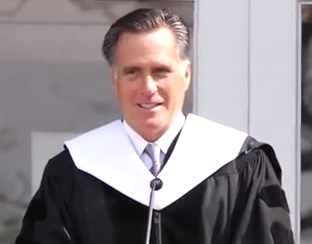 Romney shook hands with each graduate after they received their diplomas. Graduate Douglas Speck of Harrisburg, Pa., said Romney gave voice to the spirit of Speck’s years at Southern Virginia. “They gave me the courage to try new things,” he said. This entry was posted on Wednesday, May 8th, 2013 at 1:45 pm	and is filed under News & Commentary. You can follow any responses to this entry through the RSS 2.0 feed. You can leave a response, or trackback from your own site.